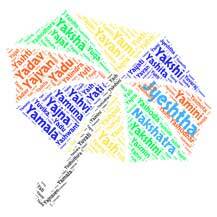 Sanskrit word Yuti literally means number to be added, sum, conjunction, union or meeting with. The name is derived from Sanskrit, where its primary meaning.. The Sanskrit word manav means human, man. Ancient Sanskrit name Aksharam (Sanskrit अक्षरम) literally r..
Yavan means worshipped, bestowed, offerer. This is a unique .. According to mythology, the girl Tanvi (originally Sanskrit)..
Acintya (a 'not' + cintya 'thought of, thinkable')means the ..
Joganatha derived from Sanskrit name Yoganatha, means lord o..
Sanskrit word Akshar (Sanskrit अक्षर) is another name of Lor..